Abigail Spanberger’s campaign in the 7th district of Virginia satisfied all four criteria (the cheap nonstop flights from Logan took care of the last one). We flew down, checked into a small hotel in the old part of town, and went at it. Our first instructions were to go to a campaign center in Henrico County, which turned out to be a typical raised-ranch home in a middle class neighborhood fully adorned with blue and white Spanberger signs. 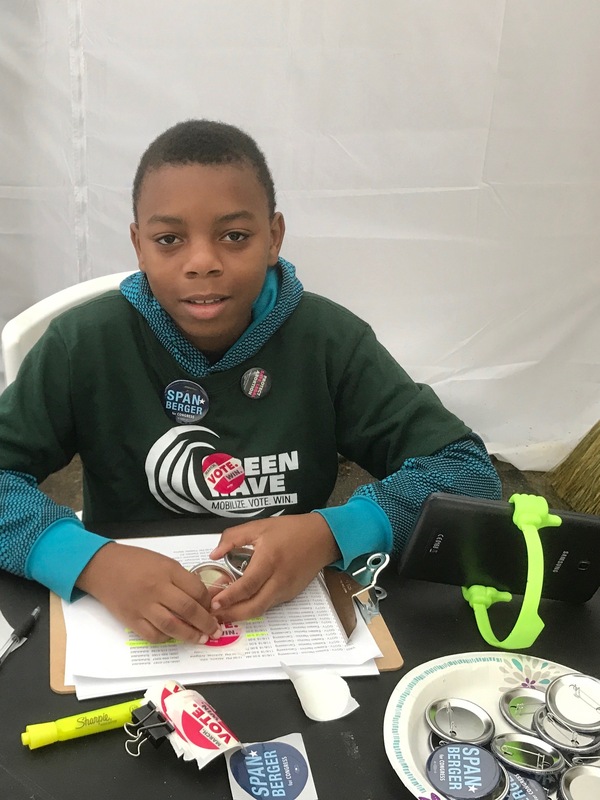 That local HQ was buzzing with cheery campaign volunteers including a 12 year old kid named Tyrell, who lived in the house and worked as hard as anyone. His bubbly personality and commitment exemplified the spirit of the place. He and the campaign operatives were organizing the volunteers and keeping track of comings and goings. Over the next four days we found ourselves in a variety of neighborhoods, running from down-at-the-heels garden apartment projects to lower middle class to middle middle class. None were terribly prosperous, but some were a step up. We noticed that neighborhood behaviors seemed to be contagious. Positive care and negative neglect. In one neighborhood there would routinely be junk strewn around un-kempt yards while a nearby neighborhood of similar price point was tidy and well-maintained. The first door we knocked on was in a neighborhood of 1200 SF post-war single family brick houses, the southern equivalent of Levittown. It was answered by three generations of an Indian family. They were happy to see us, they were planning to vote, they knew where to go, and they were voting for Abigail. That was typical, but not all of our encounters were. We spent most of the first afternoon in a subsidized housing project occupied primarily by African Americans. Rental units, two stories, 16 to a building, eight to a hallway, four off the second floor hall, four off the first. At least 75% of the occupants were single women, most with kids. Very few men. It’s not that the men weren’t home or out working, it’s that they weren’t on the voting lists. Kim took care of the clipboard and checked off the boxes on the form: conversation concluded, not home, moved, deceased, inaccessible, refused to talk. I knocked or rang the doorbells and initiated contact, but mostly we shared the interactions seamlessly. A 79 year old woman said she couldn’t get to the polls without help. We asked if we could give her a ride. She asked what church we went to. We said we’re not from here. She said she better not go with us because she doesn’t know us. We gave her the number to call for the campaign to arrange a ride. A drunk, carrying a beer and wandering around the neighborhood trying to engage with anyone he encountered, saw us as his next prey. He asked what we were doing. We told him. He wondered what difference it would make. We went back and forth. (He liked the game.) Finally, we told him we had to get back to work. He left us alone. A woman was walking home with three kids. Kim asked if we could give the kids Abigail stickers. She said sure, and we gave each kid a sticker and asked if she wanted one. She replied “Yes, and I can tell you that I’m sure gonna vote for Abigail!”. As we walked away the three little kids were all saying “thank you thank you” in sing-song voices as they proudly displayed their stickers. A tall African American man was walking into one of the buildings and we asked him if he was planning to vote. “They won’t let me, although the constitution says I can.” A felon, we assumed. “We hope you get your right back before 2020,” we said. The next day we were in lower middle class developments of vinyl-clad homes on quarter acre lots. There were roads, courts, terraces, and cul-de-sacs. It was a Monday so fewer people were home compared to the previous day. Each time we got no answer we left a campaign flyer on their door. We wrote in longhand their polling place address, and “Thank you!” There’s no way to know if some of those reminders made the difference between voting and not voting. An African American couple about my age was sitting on their front porch smoking cigarettes. 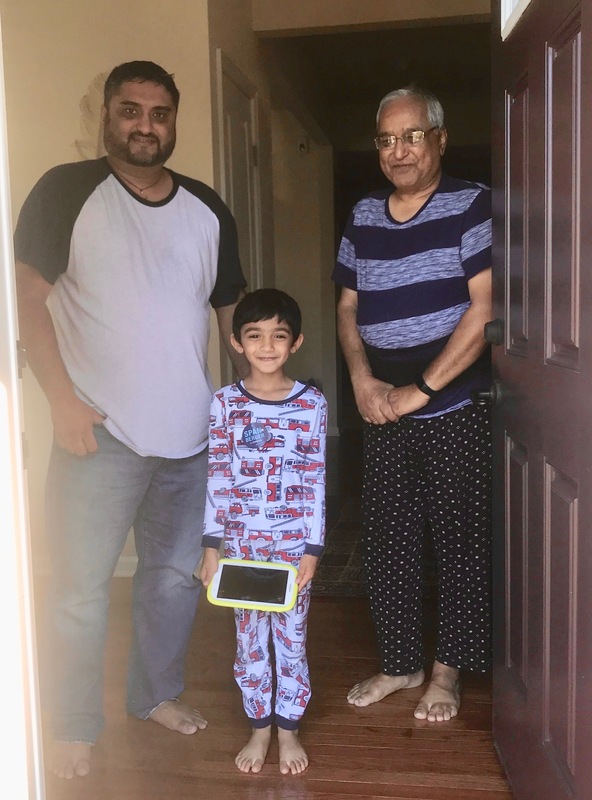 Their house was impeccably maintained, they were dressed nicely, and they wanted to talk politics. They were well-versed and had never failed to vote since coming of age (which would have been in the late sixties). They were centrists, big Obama supporters, and felt like the middle class was getting burned and shrinking. Most people were very friendly, even though in some cases their door had been knocked on multiple times over the past few weeks by one of the campaigns active in the area. Women, especially African American women, were particularly enthusiastic. It was interesting to us that, in general, women opened the door wide and men opened it a crack. On election day we showed up at HQ and were asked to help solve a problem. A polling location in Henrico County had been unexpectedly changed from a church to a school and it wasn’t clear that people knew. Most people we encountered had found out, one way or another, but at times our presence made the difference. It all felt very real, and engaged. People from diverse backgrounds and ethnicities engaging in heartfelt conversations with varying points of views. People living their lives, caring about their futures, voting their consciences. We felt lucky to share some time with them. And then, of course, there was the result. 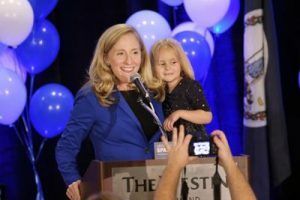 Abigail Spanberger triumphed over long-time Republican incumbent, Dave Brat. 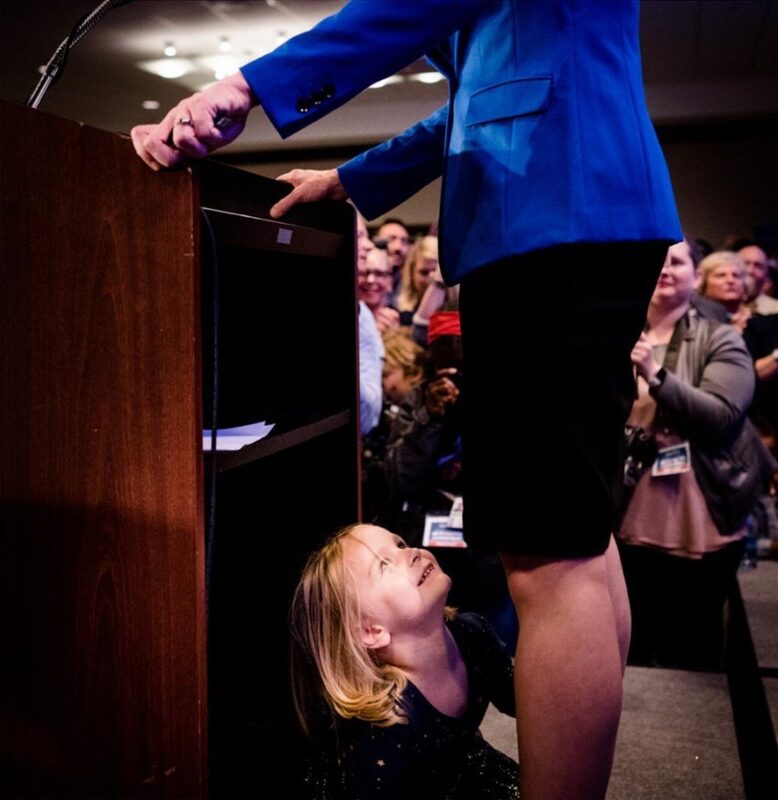 (Pictured above and to right you can see Abigail’s four year old daughter sharing the stage during her victory speech.) She was part of the blue wave of women and ethnic candidates that turned things upside down nationwide – or began to anyway. We are on our way to 2020. Trumpism is dead; it only remains to be seen how long and troubling the funeral will be. Better times ahead. Just read, you made me cry. It’s so inspirational!